57 years of Fatal Weapon The Agent Orange. In 2012, United States has launched a project to help cleaner chemical agents ‘Agent Orange’ in Vietnam. After the war of Vietnam in 1975, the first step taken by US administration. Initially the work will be started at the airport of the central city of Danang. During the Vietnam War, US forces spray millions of gallon agent orange in evergreen forests to destroy enemy’s hiding place. When special chemical spray, leaves of the tree drops very quickly. The serious harmful effect of the chemical is still running in Vietnam, people of Vietnam are still wandering around. The Vietnam government said millions of people have been affected by harmful effects of Agent Orange, of whom there are 1.5 million children Most of them are born with various types of physical problems. On Thursday, a program was organized at Danang Airport on the occasion of clean operation. Agent Orange was stored in this place during the war. And it was used to destroy secret haven of Viet Kang, the Guerrian warrior of then Communist North Vietnam. The United States embassy in Vietnam said they would give $ 4 million to Agent Orange clean operation project. The project will be managed by two US companies and joint venture with the Ministry of Defense of Vietnam. The embassy also said that under this project, dirty soil and silt will be gathered and diged. Then they will be burnt in high density to destroy the dioxin (Agent Orange). Frank Ponovan, charitable organization of USAID, told Radio Australia that the project will continue until 2016. They are hoping that by doing this the area becomes safe enough for industrialization, trade and living. Visit our site for more Technews at www.techupdatenews.com. Although the first project was conducted in Danaang Airport, a number of warehouses were set up There are Vietnam. There are two airports in it. 57 years of Agent Orange.The day was August 10, 1961. Danang Airport in Vietnam. Thousands of Gallon of “Agent Orange” the fatal chemical bomb were brought here to spray from air force on vietnam militant soldiers. 57 years from today, at first in the world’ s history USA use this fatal chemical weapons on the Vietnam’s war. After five decades, soil agent was finally polluted, but the stain remained clear. Vietnam’s 40th anniversary of the end of war is April 30, 2015. Cold War has been closed in these four decades. Vietnam has changed Many things have changed in the United States and around the world. But did not turn out to be reality of lives of victims of Agent Orange in Vietnam. For almost 10 years, US military spreads dangerous chemical agents orange across the vast area of ​​Vietnam. The radioactive eruption of Agent Orange is one of the most dangerous chapters of man-made health disasters in the history of the world. From 1961 to 1971, United States military forces spray a huge quantity of agent airplane from the aircraft to defeat the communist guerrillas of North Vietnam. The operation named Operation Ranch Hand’ was spread on 45 million acres of land in Vietnam, and this toxic chemical was spread. Agent Orange is sprayed in farmland, river, canal, roads and military bases, including shelter forests, where the guerrillas hide. According to the United States, for more than a decade, the country’s army has sprayed about 19 million gallons of agents in Orange Spray. This agent is a special microsex of deadly toxic chemicals of dioxin-compound. In the forty and fifties, United States and Britain jointly researched the chemical production to carry forward ‘herbicidal warfare’. Sprinkle this chemical, the plants die, leaves fall off, agricultural fields become unproductive. Even where it is spread, soils are so contaminated that the fertile soil of the land is destroyed. British used toxic chemicals of diocese-compound in region to curb the Malayan insurgency in fifties. 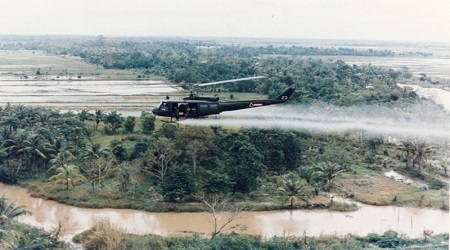 Mixing Corporation and Dow Chemicals for United States Defense Ministry for the use of Vietnam War, prepared this herbicide known as ‘Agent Orange’. According to the conventional idea that this chemical was carried out in a metal drum, due to the orange straps, its name becomes Agent Orange. The fight against the Vietnam War began with severe criticism of Agent Orange when US forces began to suffer from health problems due to harmful chemicals. The effects of these chemicals can lead to serious physical and mental impairment. The victims of respiratory problems may be exposed to cancer. The children of the affected children may also be born with birth defects. The Vietnam Association of Victims of Agent Orange (VAVA) news agency Reuters has reported that nearly 48 million people in the country were victims of Agent Orange. Among them, three million people were suffering from severe health problems including cancer due to Agent Orange. At the same time, according to Vietnam’s estimates, at least 4 million people have died due to agent hunting or being disabled. And later, in Vietnam, about five million children suffering from Agent Orange have been subjected to severe birth defects. Reuters photographer Damir Sagolaj recently taken photographs of victims of Orange Orange victims in Vietnam. In the Reuters report about four decades after the end of the war, he wrote, “In 1971, the United States Agent Orange stopped spraying and the war ended in 1975. Twenty years later, some people in the village and the city did not know about this. Forty years later, the children and their parents are still suffering from the tragedy and most of those stories are not told. Agent Orange is a huge tragedy, complete with a combination of very small tragedies. The photographer of Bosnian originally wrote, “Despite many frustrations, I have nothing to do with my picture without further referring to this story. My photographs are not about the previous or the next, but they are all about the present. How we neglected history and the events of the past. I’m afraid our future might be that way. For more update about science, information & technological news, likes our page. Write yours comments and share our news of 57 years of Fatal Weapon The Agent Orange.